آتشین‌بار, محمد. (1394). منظر خیابان نفوذی؛ تأثیر خیابان‌های نفوذی بر منظر شهری پاریس. مجله علمی-ترویجی منظر, 7(30), 54-61. محمد آتشین‌بار. "منظر خیابان نفوذی؛ تأثیر خیابان‌های نفوذی بر منظر شهری پاریس". 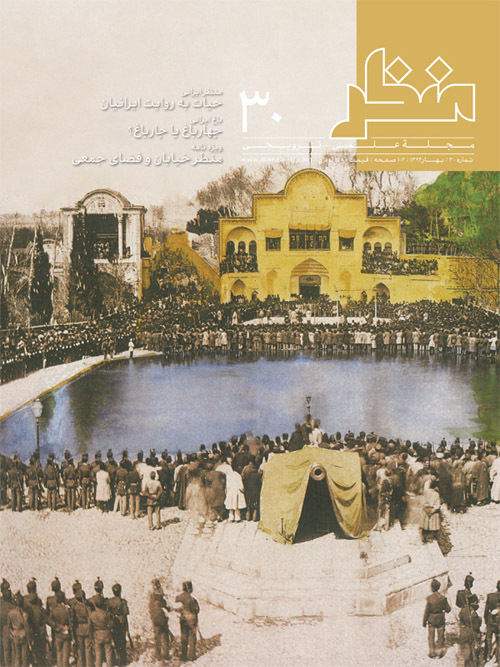 مجله علمی-ترویجی منظر, 7, 30, 1394, 54-61. آتشین‌بار, محمد. (1394). 'منظر خیابان نفوذی؛ تأثیر خیابان‌های نفوذی بر منظر شهری پاریس', مجله علمی-ترویجی منظر, 7(30), pp. 54-61. آتشین‌بار, محمد. منظر خیابان نفوذی؛ تأثیر خیابان‌های نفوذی بر منظر شهری پاریس. مجله علمی-ترویجی منظر, 1394; 7(30): 54-61. خیابان نفوذی محصول تبدیل خیابان از عنصری منفرد به عنصری مرکب در تحولات شهرهاست که هدف اول آن گشایش دسترسی از میان یک محله متراکم است؛ اما قبل از آنکه یک خیابان‌کشی باشد، عملیات زیرساختی ویژه‌ای با محدودیت‌هایی همچون تخصیص زمین است. خیابان‌های نفوذی از مهم‌ترین‌ فضاهای مؤثر بر ادراک مخاطب از شهر هستند که نقشی مهم را در ارتقا یا تنزل منظر شهری بر عهده دارند. این مقاله در‌صدد است از طریق تبیین ابعاد و تحلیل تفسیری ارزش‌های منظرین خیابان نفوذی و با تکیه بر تجربه پاریس در این زمینه، به ارزیابی کیفی تاثیر این نوع خیابان در منظر شهری بپردازد. The piercing street is the result of transforming the street from a simple element to a complex one in the primary aim to provide access in an intense neighborhood; but before being a business -way, this is a special infrastructural business bounded to certain factor including allotments. The piercing street is the most efficient space in the urban perception of the city by users and therefore, has a role in the qualitative improvement or reduction of urban landscape. It seems that the existential philosophy of piercing streets is to control social relations by the government, which is realized by reconnecting urban principal points. Constructing a piercing street is considerate as a huge landscape achievement capable of transforming the city’s spatial quality. The present article constitute a practical research in analyzing the street landscape and follows a creative method which is “the street landscape analyzing matrix”, derived from the author’s Ph.D. thesis. It studies the qualitative impact of piercing streets on urban landscape. The quantitative evaluation of this impact results from the sum of the mentioned matrix which will be completed in MORPHOCITY multidisciplinary research group. This article attempts to present a qualitative assessment of the impacts of piercing on the urban landscape through an innovative model by explaining the aspects and interpretive analysis of its landscape values in studying the case of Paris. The evaluation of piercing street indicates the quality and quantity of the desire to attempt utopia or to stay in the existing fact. In the middle of nineteenth century, modernism appeared in the French society through a governmental decision and by an authoritarian approach, cut everything in its way for leaving behind the traditional urban structure with a renovation slogan which was ruled by the municipality: piercing streets as the symbol of a modern government appearance. These streets, whether single or multiple, had a deep influence on Paris’s persistence urban landscape. The actual Opera Avenue is one of this piercings that has succeeded in promoting the urban spatial quality in adapting with user’s subjectivity of Paris.